I was so pleased to finish the Black Fluffy Thing and the Vintage Unvelvet and cross them off my WIP list! Down to 65! (AND, cross off 2 gifts as well.) But then, I realized that the Multidirectional Silk Scarf I started last week never made it onto my WIP list, so I had to add it in. Up to 66. 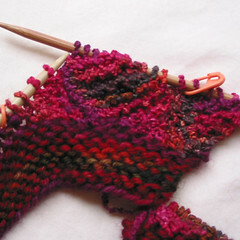 And then, I started a new project, a scarf for a New Year's gift... So, back to 67. Hahaha. You see how this works? This holiday and gift knitting thing is going to throw a monkey wrench into the whole WIP Management thing. Notes: The Vintage Unvelvet was mostly a joy to knit. The pattern really bothered me for the first, oh, 3 feet. 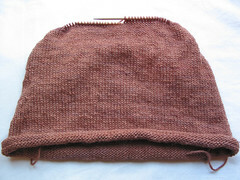 There is just enough difference between the front and the back that I have to look several times each row to make sure I'm putting the knits and purls in the right place. Can't watch TV, can't read blogs. But, the last foot and a third I got over it. Maybe it was the crappy late night TV... 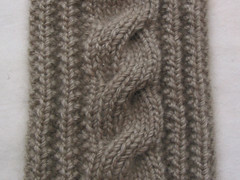 I really like the way it looks; this yarn shows off the pattern much better than the Touch Me. The cashmere blend is extremely soft (that's where the "joy to knit" comes in), but might deposit bits of cashmere fluff on unsuspecting fleece... haha, not the sheep kind of fleece, silly. I'm still not crazy about the color, and I hope the recipient doesn't mind it too much... But if so, I'll consider dyeing it. Not with Kool Aid. Not this year. Notes: The pattern was kept simple because anything more would get lost in the black and boucle. 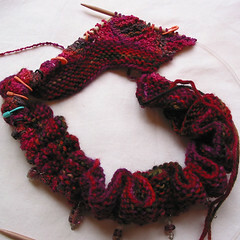 And while the pattern irritated me (mostly because I couldn't see it), the last foot and a half didn't bother me at all. Maybe it was the home stretch. Maybe it was burned onto my brain. Maybe it was the extra light from pulling the floor lamp closer to me. 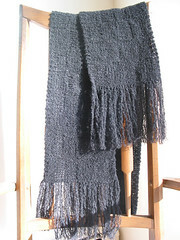 The scarf grew a bit in the wash (almost 6"), and the fringe got a little ratty (gave it a trim). But it did get softer! 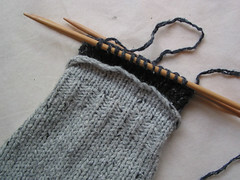 I wasn't crazy about the yarn, but that could have been the needle size as well. 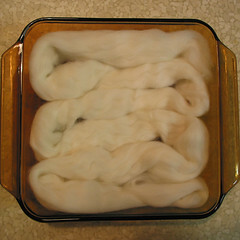 But since it got softer with a wash, I may skein and wash before using next time. May as well try, I have pounds of it left. 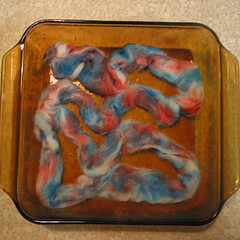 I've been wanting to try out Kool Aid dyeing for a while now. Finally gave it a go! 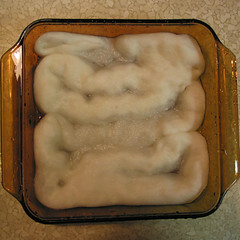 I added enough water to fully cover and let soak for at least an hour while we prepared and ate dinner. It felt weird squishing it, not at all as I expected. Like there was a sheath around it. 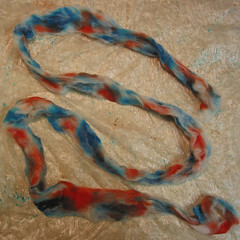 When I was ready to dye, I poured out the excess water and placed the fiber on a garbage bag. I had pre-mixed a few Kool Aid packets in small jars, each with 2 tablespoons of water. The blue is Blue Moon Berry. The red is Solar Strawberry StarFruit and Soarin' Strawberry Lemonade (they looked pretty close so I used them more or less together). I used a small child's medicine dosing syringe and went at it. Probably used too much for what I was trying to do, I was actually hoping for a more dot-like effect, but got carried away. Yep, Kool Aid does dye. I zapped in the microwave for 2 minutes x 3. 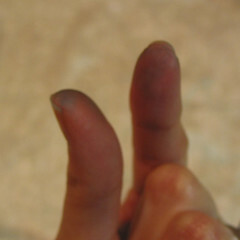 Between each zapping I took a paper towel and dabbed to see if the dyes came off. 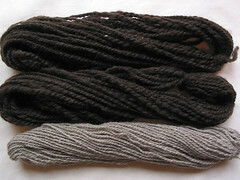 Now that it's done, I'm guessing the colors will bleed while I'm spinning and end up a murky brown. Maybe more blocks of color would work better. Or sticking with the dots, smaller and more separated. Well, we'll see. It'll be an adventure! It's cooling; it's hard to be patient, I want to do something with it! 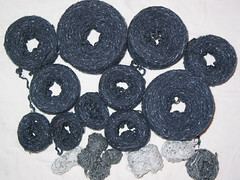 Lookie what came in the mail -- stitchmarkers and soap from soapfibergal! They're from a trade on The Knitty Coffeeshop. I couldn't wait to use them. Look how purty! And they match the yarn perfectly. 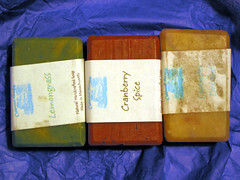 The soap smells wonderful. Thank you, soapfibergal! 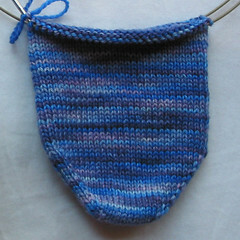 You can sorta make out the square that I just knit. 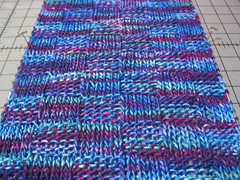 Because it's boucle it doesn't have the same give, so... well, we'll see. I took the plunge and steam blocked the Silky Soft Confection. Fingers are crossed. The cashmere scarf is now about a foot long. Below is the back, which looks a little different from the front. 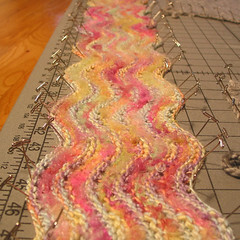 The pattern is Vintage Velvet from Scarf Style. The original is knit with Muench's Touch Me, hence the "velvet"; but since mine is so very not velvet, I'm calling mine Vintage Unvelvet. Original, eh? And finally, I did some spinning! The brown is coopworth 2-ply. Worked on my long draw and non-parking techniques. 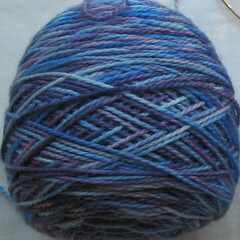 It's a worsted to bulky weight, which was tough to do on my spindle (it's too light; good for finer yarns, though). Mebbe time to shop around for a second spindle. Any suggestions? Before I met Scott he hardly ever wore sweaters. He couldn't find any he liked. He's allergic to wool (that's a whole other topic right there). But he LIKES sweaters. In fact, he likes the look of certain wool sweaters, especially tweedy wool sweaters. He likes roll necks and sleeves. He likes slouchy sweaters; if necessary he will (attempt to) buy a sweater two sizes too big to achieve that look. He likes ... subdued colors. When he finds a sweater he LIKES, Hurrah! Hurrah! So when I found him the most special sweater -- light grey tweedy look with roll neck and cuffs, casual, roomy, and not a jot of wool -- I was excited for him. He didn't pick it up because it looked like wool. What a find! And next to it, sweater number two: dark blue/grey tweedy look with wide ribs, casual, roomy. The sweaters received much care, wear, attention. They made him happy. But, sadly, his sweaters don't have a long shelf life. They shrink. This is a cause of great sadness. My first knitters tip: don't put it in the dryer. That helped. 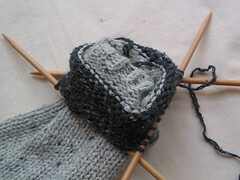 My second knitters tip: stretch it out when it's wet. That helped some more. But when these failed and the most special sweater was too short to wear, it was a dark day indeed. But wait! 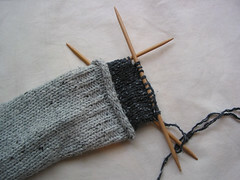 I'm a knitter! I'm (sorta) fearless! 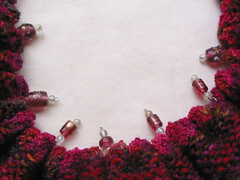 I just read about recycling sweaters! We made a plan. Sweater number two took one for the team. And the most special sweater was gonna get a graft. Extensions, if you will. A "regrow". Except it was almost summer and who wants to work on a fall sweater in the summer??? It seems a smooth transition (no pun intended). And when I unroll the cuff, you can see a slight puckering at the pick up point, which I hope will remain hidden in the roll. 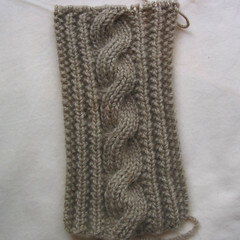 My first pick up attempt was a few rows below, where the ribbing ends, and was done with wrong side facing. Besides the puckering, the roll no longer rolled, just sorta folded over; and since it was picked up wrong side facing (what was I thinking? ), it wasn't a smooth transition. This time, I looked at where the natural roll occurred and picked up a row or so higher. 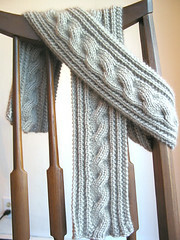 Here be a new scarf I started using the cashmere/merino yarn I picked up at Mini Mills in PEI. The scarf is for... a man. That's all I'm gonna say.